Dr. Montalbano’s research interests focus on modern and contemporary Italian literature, culture, philosophy, and history. 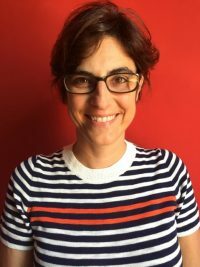 She adopts an interdisciplinary approach to Italian Studies that includes literary criticism, aesthetics, phenomenology, and gender and trauma studies. Her work explores criminal and political violence and their representation in memoirs, media, and film; testimony and victim-centered narratives; the relationship between body and language; and feminism and biopolitics. She is currently writing her book Kidnapping in Modern Italy: Language, Disembodiment, Experience. “La memoria privata degli anni di piombo.” In He was my father: The ‘Years of Lead’ in the postmemorials of the victims, edited by Sciltian Gastaldi and David M Ward. (Oxford: Peter Lang, forthcoming 2018). “Sulla mafia: la memoria e la parola responsabile.” In Curiosa di mestiere. Saggi su Dacia Maraini, edited by Manuela Bertone and Barbara Meazzi. (Pisa: Edizioni ETS, 2017). “Snatched from the World: The Phenomenology of Captivity in Italian Ransom Kidnapping,” Modern Language Notes, 132.1 (2017): 204-222. “Un’emergenza lunga trent’anni: lo Stato e i sequestri di persona a scopo di estorsione.” In Democrazia insicura. Violenze, repressioni e Stato di diritto nella storia della Repubblica (1945-1995), edited by Patrizia Dogliani and Marie-Anne Matard-Bonucci. (Rome: Donzelli Editore, 2017), 155-167. “Ransom kidnapping: the anonymous underworld of the Italian Republic,” Modern Italy, 21.1 (2016): 35-49. “Femminismi e movimenti delle donne nell’Italia del Duemila,” Narrativa, 37 (2015): 31-47. “Diario di un satiro militante: il cinema di Sabina Guzzanti.” In Zoom d’oltreoceano: istantanee sui registi italiani e sull’Italia, edited by Daniela De-Pau and Simone Dubrovic. (Manziana, Rome: Vecchiarelli, 2010), 243-256. “Pier Paolo Pasolini e Maurice Merleau-Ponty allo specchio: Una lettura di Petrolio.” In Pier Paolo Pasolini: in Living Memory, edited by Ben Lawton and Maura Bergonzoni. (Washington, DC: New Academia Publishing, 2009), 185-203. “Livio Romano Mistandivò” in Immaginazione vol.2, January 2004.